My neighbor has the most beautiful tulips you have ever seen! I get to see them every day when I walk my children to school, when I’m out running errands, walking the dog, and picking the kids back up from school. I anticipate her tulips every year! There is no doubt in my mind that she has done the prep work in advanced to produce such a beautiful display. 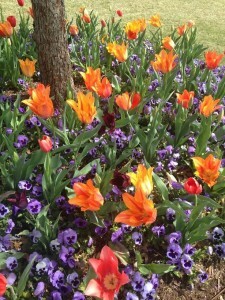 Tulips must be planted in the fall in order for them to have time to bloom in the spring. So planning for the flowers you want produced in the spring is critical, yet waiting for the reward of seeing their beauty is antagonizing! She knows exactly when to plant them, how much water to give them, when to prune them, and how long to wait before she cuts them down for the next year. How does she know all this? She is an expert! Landscape design is her business. To say she has a green thumb would be an understatement! This lady has it going on in the gardening world, and I am totally envious! I so want my yard to be that gorgeous! With beautiful flowers everywhere, and not a weed insight! But if I’m not willing to do the work, envy is all I’ll get. Nothing gorgeous will be produced. Oh, I might be the talk of the neighborhood, but not for the beauty I am displaying. Living a life that burst forth a beautiful harvest of gorgeous traits is hard work! It takes time. It takes planning. It takes intentionality! We see other people’s lives with rose colored glasses, but sometimes we truly meet a person who shines God’s glory in a beautiful way. But, instead of soaking in their glory, we bear a smidge of envy. We long to be close to God like they are. We want to display His glory like they do. We long to speak and smile and sing and teach with such boldness like they do. Yet, what are we doing to cultivate that in our lives? Are we putting forth the effort now to produce a harvest in due time? Start now! Don’t wait until the season has past and regret takes root. Plant the seeds of Jesus in your heart and mind. Grow closer to Him by spending time with Him each and every single day. Is it easy? No! Do you long for it? YES! Then go get it sister! He is waiting with open arms to produce such a glorious display in your life that others can’t help but see Him!